Ambassador David Friedman offers thoughts and prayers, as memorial service takes place for 18-year-old US citizen murdered in Gush Etzion. United States Ambassador to Israel David Friedman has offered the US's heartfelt thoughts and prayers to the family, friend, teachers and classmates of terror victim Ezra Schwartz on the second anniversary of his murder. In a letter written on Monday to be read at a memorial service today at Oz Vegaon Park in Gush Etzion, Friedman said, "Ezra was a patriot because he believed so deeply in the ideals and values shared by the United States and Israel." He also wrote, "Although I am currently in Washington, D.C. and unable to attend today's ceremony, I join you in spirit as we renew our commitment to living a life of service to others and to remaining resolute in the defense of our values and the defeat of evil." Last week, Friedman cancelled his planned appearance at the memorial service, after initially telling organizers from the Orot Yehuda Yeshiva in Efrat that he had accepted their invitation to the service honoring Schwartz, an 18-year-old American yeshiva student who was killed along with two others in a terror attack in Gush Etzion south of Jerusalem in 2015. Schwartz, a native of Sharon, Massachusetts, had been studying in the Ashreinu Yeshiva in Beit Shemesh during his year-long stay in Israel. The memorial event is taking place today at Oz Vegaon park, near the scene of the deadly attack in November 2015 in Judea. Schwartz was on his way there to volunteer when he was shot at the Gush Etzion junction. The preserve was initially designated an ‘unauthorized outpost’, but subsequently received backing from then-Defense Minister Moshe Yaalon, who endorsed retroactive authorization for the park. While initially dedicated to the memory of the three murdered Israeli teens kidnapped in 2014, in December 2015, a month after their son’s death, the Schwartz family sponsored the paving of a new hiking trail there in Ezra’s honor. 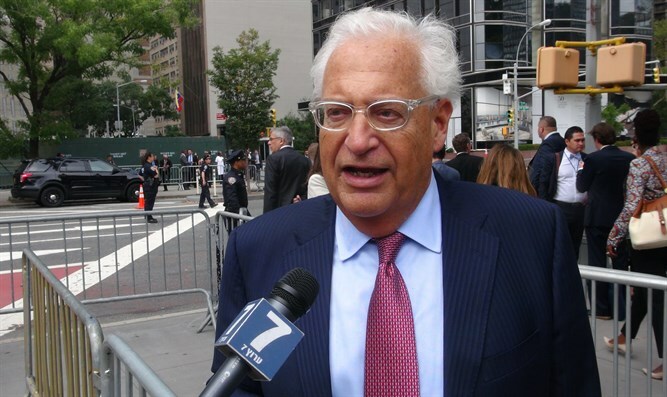 Organizers of the event said that Ambassador Friedman initially accepted an invitation, which had been extended to the ambassador because Schwartz was an American citizen. But a senior embassy official told Arutz Sheva that ambassador was forced to decline over a scheduling conflict, adding that he was needed for consultations in Washington and would not be in Israel on the day of the memorial. "US Ambassador David Friedman is unable to attend the memorial for Ezra Schwartz, as he is engaged in consultations in Washington DC, November 28th. The Embassy will be sending a message of support."